What really happened on the day the sun stood still? : Joshua 10 revisited. June 21, the longest day of the year or summer solstice, is right around the corner. In order to mark this astronomically important event I decided to take a look the longest day ever recorded in history, which appears in the 10th chapter of the book of Joshua. Before we can move ahead with this passage some background information would be helpful. The book of Joshua records the conquest wars fought by the armies of Israel under the leadership of a man called Joshua. These wars were fought in Canaan, what we call today Syria and the “holy land”. When these wars were started, the armies of Israel were nothing more that a rag tag group of warriors, but with the help of Yahweh, and Joshua’s leadership, this group of warriors were able defeat, time and time again, the armies of much bigger and older cultures. One of the cities in Canaan, Gibeon, made an alliance with Joshua. Five other surrounding cities were not happy with this arrangement and decided to join forces and attack Gibeon. When this lone friend of Israel's heard of the approaching armies, they called on Joshua to honor their alliance and help them defend their city. We take the story right at the moment in which Joshua is departing with his army to defend Gibeon. This story has been used to make an argument against the Bible as the word of God. It is an argument which goes like this: how can a book supposedly inspired by God, get the way the universe works so wrong? We are talking about how Joshua asked God to “stand still the sun”; you see in Joshua’s mind the Sun moved across the sky, East to West every day, although we know this is not the case. How can the book of Joshua make such a horrendous mistake about the way the universe works? The problem with this question is that makes invalid assumptions about the book of Joshua; that is that the primary intention of the author was to present how the universe worked that day. This book of the Old Testament is just an historical account of how Joshua and his small band of warriors, time and time again defeated much larger armies, until they gained control of all the land of Canaan. It presents what Joshua did and how God helped him. This book is not a cosmology treaty. It tries to put into context events which were out of the ordinary and that were not understood by the writers. What we read in it is basically the authors' attempt at describing a miraculous event using their understanding of the way their universe behaved. which means that Joshua's army had to march 20 miles after an 18 miles overnight trip. That is 38 miles! Which, by the way would place the final battle in the late afternoon. It is at this time which Joshua makes his prayer to God to stand the Sun still so he can finish what we would call in modern times a "mop up" operation. Now lets do an assessment of Joshua and his army here, they have walked all night, they attacked early in the morning and now after another 8-10 hours of marching they find themselves battling their enemies again. They were tired, hungry and most likely they were operating on pure adrenaline but more importantly...They wanted to finish the job started so many hours ago. 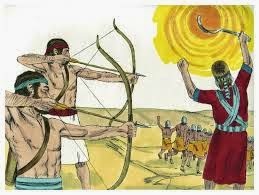 It being the late afternoon, Joshua realized he was running out of daylight so in his mind, the Sun needed to be stopped in order to make this day longer and finish disposing of his enemies. Many years ago I worked with a brilliant mathematician, who told me that he had lost his faith because of this story, he reasoned that if God were to stop the earth rotation, everything that is not literary nailed to the ground would come out flying because of the change on rotational speed; not to mention the catastrophic effect in plate tectonics, and ocean tides. My friend's literal interpretation of this story he could not conceive of a God so powerful that he would take into consideration all the effects of stopping the earth rotation. At the end of the day, this interpretation could only be applied to a less than infinitely powerful being. Another mistake my friend made was that he limited himself to just ONE potential explanation, the most literal of all. But, the thing is... there are other explanations that could cause Joshua and his men to think that the day was longer than normal and that the Sun stood in the middle of the sky, these are the ones I would like to explore. Since Joshua was asking the wrong thing God acted in a way that might have looked as if that the Sun had stopped in the western sky. Some people have speculated that, since the sun was in the West, perhaps there was some type of meteorological phenomena which reflected the light of the sun after it had set, something like Sun Dogs or a phenomenon know as “noctilucent” or “polar mesospheric” clouds. Which might be related to the strange “hailstone” storm which killed many that day. Others have speculated that perhaps a meteor appeared bright as the sun before it disintegrated in the atmosphere. bubble is moving slowly. * So the Sun would appear as if it was standing in the sky. Another theory I find interesting is based on “Time perception”. There is a well known psychological phenomenon in which a person in a high level of stress becomes so focused that it looks as if time has slowed down around them. With Joshua and his men having been for such a long time in a high level of stress, it is possible that they lost track of time itself (After all, in the times of Joshua there was not reliable way of measuring time) so after repeated cases of feeling time slowing down they might have thought the day was much longer and in their minds the only way this could be possible was by divine intervention. Now I would be remiss if I were not to mention another interpretation based on the type of language used by writers of this book. Looking at the text we can see that the story changes "styles" when quoting Joshua’s prayer, also after this quote, the reading mentions the Book of Jashar, which scholars believe was a book of poems and songs about great Jewish heroes of this time (a book now lost). Because of these some scholars believe that this event never really happened and it is just a poetic way of saying that on a long day of fighting a superior enemy, God was helping the armies of Joshua to such a degree that “The sun and the moon stopped” to bring Israel victory. Of course we can speculate more but the reality is that we will never know what happened that day, only that it felt as if "The sun stood in the sky" for a whole day. Like I mentioned before, some people have used this story to point out that the Bible is not reliable because it makes an error in the assumption that the sun rotates around the earth; but this story is not about celestial mechanics but about how God responded to Joshua’s prayer. Even when He was asking for the wrong thing God graciously responded to his prayer.This in it self should be a source if great consolation, for how many times we have found ourselves asking God for the wrong thing, without knowing or understanding what we were talking about? God's eternal mercy is manifested on these moments, we might not have any idea what is he doing but we can be sure that he is making the universe work in the most beneficial way for all of His children. * Now this reminds me of an old Start Trek episode titled “Wink of an Eye” in which a group of aliens, existing in a high level of acceleration attempted to take over the Enterprise. While they were moving everyone else appear static.